Sasquatch! Music Festival has announced an incredible lineup for the 2018 Memorial Day Weekend celebration May 25 – 27th. In 2002, Sasquatch! established itself as a premier destination festival as well as the crown jewel of music events in the Pacific Northwest. With the breathtaking Gorge Amphitheatre overlooking Washington’s Columbia River, festival creator and producer Adam Zacks set out to match the strength of the location with a stellar and unique lineup year after year that aims to be a music lover’s paradise. In November, early-bird tickets were made available for the 2018 festival which are all sold-out. 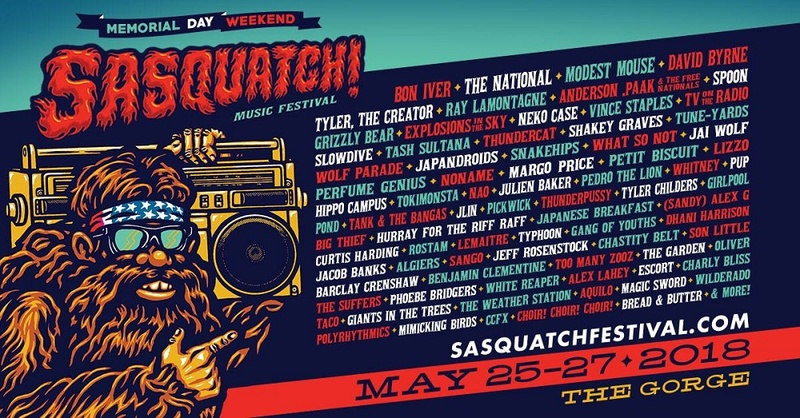 Tickets to the 2018 Sasquatch! Music Festival will go on sale Saturday, February 10th at 10am (PST) at SasquatchFestival.com. Watch the lineup announcement video here.